Swipe. Find a blog post you like on a topic you're confident your customers will be interested in. Find two more by doing a search using the topic or keywords from the post. Look for three that bring different elements of the topic into play. Hmm. What do we have a here? Looks to be a cool post about the fine art of swiping when you need inspiration. Perfectly swipeable. LinkedIn endorsements are meant to provide credibility and networking opportunities. Has LinkedIn ever notified you that someone has endorsed you for skills and expertise that have absolutely nothing to do with your actual skills? Or worse, you don’t know the endorser at all, so how can he or she endorse any skills you have? Sometimes people are endorsing you so you’ll see the notification and they’ll be on your radar. Other times, people are endorsing you because they’re friends or colleagues and they think they’re helping you. Either way, if people are endorsing you for the wrong skills, then your real skills are being overlooked. Luckily, you can help people endorse you for the skills that really matter to you. Below I’ll show you how. If you want to control which skills are most prominent on your LinkedIn profile,set up the Skills & Endorsements section of your LinkedIn profile. This lets you subtly encourage others to use those skills when they endorse you. If you don’t have the Skills section on your profile, go to Edit Profile and look to the right. You’ll see a list of sections recommended for you. Click on the Skills option to add it to your profile. 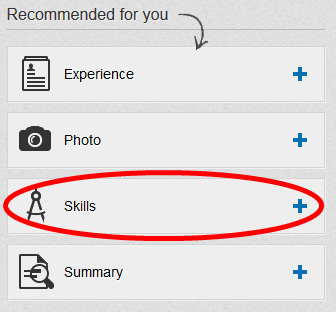 It’s important to have the Skills section activated on your LinkedIn profile. 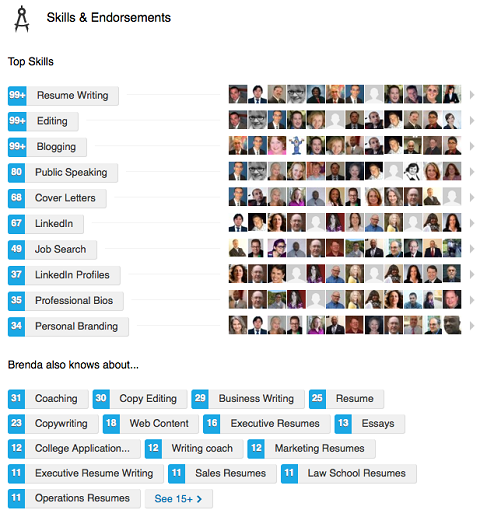 You can add up to 50 skills to your profile, so go ahead and set those skills yourself. Don’t be shy. Tell the world what you want to be endorsed for. Don’t let a bunch of strangers decide how you present your areas of expertise! As you begin typing your desired skill, you’ll see a list of related skills you can choose from (but you don’t have to). The list is likely compiled based on how others have searched for people with a particular skill. Decide what skills you want to be endorsed for. When you first add skills to your profile, they’re listed in the order you entered them. As soon as people start endorsing you, though, the skills you are most endorsed for will rise to the top of the list. Your 10 most endorsed skills will show up automatically; the other skills are listed under them. You can decide what skills others can endorse you for, but they determine the top 10. When someone endorses you, you get an email notification with the option to Add to Profile. 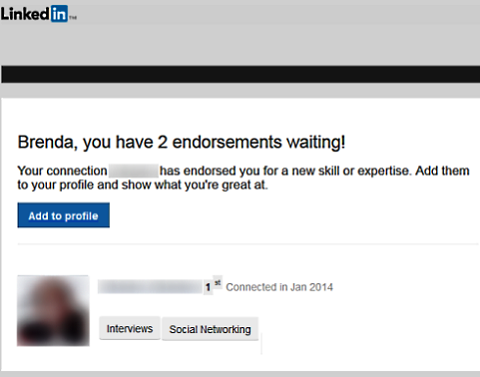 LinkedIn tells you when someone has endorsed you. When you click Add to Profile, you’ll end up on your LinkedIn profile and see a list of all of the potential skills you can add to your list. Here’s where you exert your control: If people endorse you for the wrong skills, you don’t have to accept the endorsements! Just click the Skip button. You don’t have to accept skill endorsements that don’t fit with your profile. At least once a month, visit your LinkedIn profile and do a quick cleanup. In Edit Profile view, scroll down to your Skills & Endorsements section and click Edit. Remove any skills you don’t want to be endorsed for. You can remove a skill by clicking the “X” next to its name, or you can add new skills as necessary. Edit your skills list about once a month. If you find you’re still getting too many endorsements for the wrong skills, it’s time to demote those skills. 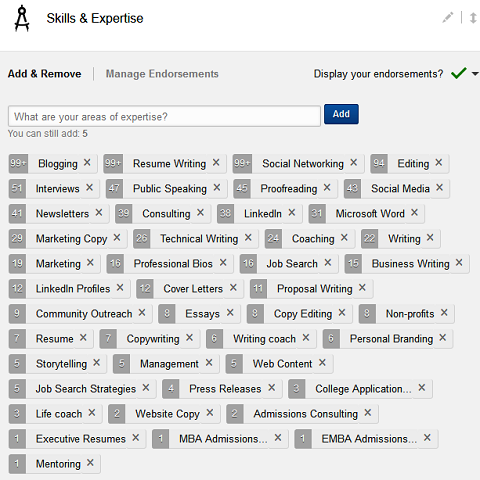 In Edit Profile view, scroll down to your Skills & Expertise section, click Edit, then click Manage Endorsements. You’ll see a list of your skills and all the contacts who have endorsed you for each. Manage your endorsements to ensure your best skills are front and center. 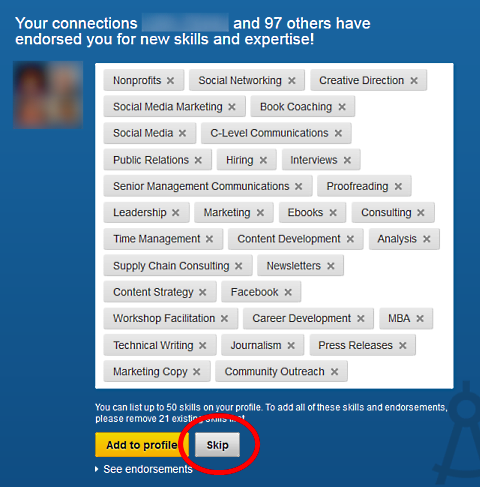 Click the skill you want to manage to see who has endorsed you. 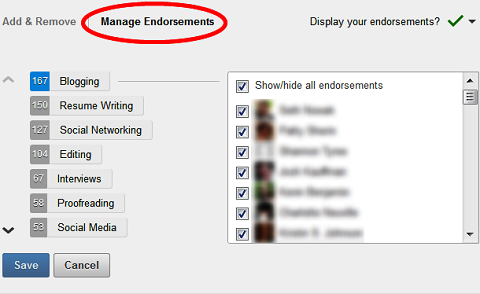 Now you have the option to show or hide either all of your endorsements or individual endorsements. If you uncheck any boxes in the Show/hide list, the number of endorsements counted for that skill will go down by the number of boxes you uncheck. So let’s say in the example above, I wanted to move Blogging out of the top 10. This skill currently has 167 endorsements. I could uncheck 100 boxes and that skill would be left with only 67 endorsements, allowing another skill I care about (with more than 67 endorsements) to rise into the top 10. Networking is the primary goal of LinkedIn, so don’t be afraid to meet new people, rally your community or give back to others. Everyone is looking for relevant (not random) endorsements. To help build your top 10 skills, write to your lists and ask them to endorse you for a specific skill or two. Be clear about what you’re asking for so you don’t end up with additional “helpful endorsements” for skills you’re trying to de-emphasize. Don’t forget the importance of reciprocation! When others endorse you, be sure to endorse them as well, but ask them what skills they’re most interested in promoting! 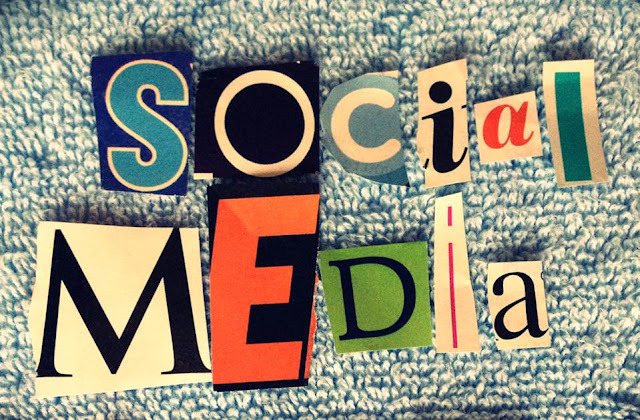 In 2013, both large and small retailers earned business by making social media a priority. But it was the small merchants, operating exclusively online, that dominated the top ranks of the social media 500, takes a closer look at how SMBs can be successful on social media by understanding the power of smart placement, great content and nimble response. According to an Internet Retailer study, monthly referral traffic to e-commerce websites from Twitter, Pinterest, Facebook, and YouTube increased 42 percent, while the revenue generated from those visitors jumped nealry 63 percent. Spending on social ads by retailers supplying data increased 400 percent in 2013. As many a great graphic and web designer knows, human behavior is just as important to a new design as the required elements themselves. Knowing the normal patterns of the human brain can help your designs have more influence while conveying the right message to your clients’ target audience. By learning the psychology behind decision-making online, design can be more effective overall. What people notice first on a website depends on what they are looking for online. If they are looking to buy something, then they may look for a specific product or the e-commerce category page. However, if they are information-seeking, they could respond to a specific call-to-action for a white paper on the industry or the search bar. In order to develop a design that fits, design the site to accommodate each type of user without making the design overwhelming. When users are overwhelmed with choices, they aren’t as satisfied and aren’t as effective in the work they output, according to a 2000 study published on PubMed. By limiting how many directions a user can take once they get to a website, the more likely they are to stay on a page. Try to limit decisions into main categories that are easy to understand and cover what most groups of users are looking for (e.g. Buy, Call, or Learn). Content is one of the most integral parts of web design, and the formatting and typography of the text is just important as the text itself. According to Inspired Mag, an eye-tracking study concluded that large headers and call to action buttons actually kept users’ attention longer than images. When creating a layout, place your major call to action headlines and button elements on the design first, then build the structure around it. This is because larger, more eye-catching text actually can also help users get a bigger overall picture of what the website is trying to say. One study done by the Nielsen Norman Group stated that users only read, on average, 20% to 28% of content on a website on a normal visit. Combine this with the average web user’s attention span of 8 seconds in 2013 (down from 12 seconds in 2000, according to Statistic Brain), and call-to-action headers and buttons are more important than ever. Keep call-to-actions easy to read and understand that get the point across in as few words as possible. Too many words will lose users’ interest. As creatives, we know that typography can have a huge influence in the way customers are made to feel about a product or service, whether they know it or not. The right typography can persuade a user to buy, love, and learn about an organization’s products, based on kerning, curves of the font, and even color. We immediately develop emotions and judgments based on the font used. This means that, to the user, two different types of fonts don’t mean the same thing. Taking the time to focus on the branding behind typography used on the page has a direct influence in the overall effectiveness of the site design. 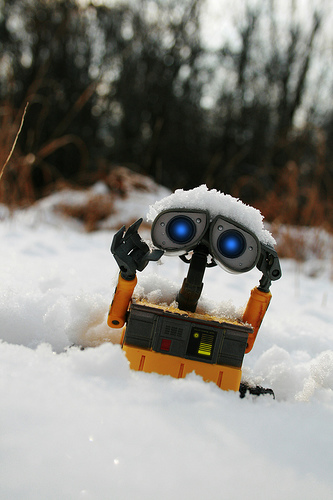 Photos are also another element of design that can influence a user’s brand sentiment. The photo’s composition and colors should both be taken into consideration, as both have a subconscious effect on telling the user what they should do on a website and how they should interact with the brand. In the example to the left, the subjects are happy, so the user is made to feel happy as well. This is the effect of emotional contagion, which was developed by Elaine Hatfield, a professor of psychology at the University of Hawaii. People consciously and subconsciously influence one another’s emotions based on the emotions they are displaying to others. This means that happy people or elements that people associate with being positive can influence a user’s feelings about a company or product. Try to choose photos that embody the emotion the company is wanting the user to feel about their products. Artistic composition and subject is not only focusing on what is eye-catching, but also what holds the best user experience. Placing text or other elements on top of photos requires the right contrast in order to make it readable. In addition to the image composition itself, the text surrounding the photos can reinforce key points within the website, whether through integrated calls-to-action but also as image “captions”, either literally or in a design sense. Advia Internet cites a study where participants were more likely to read image captions because their eyes were drawn naturally to the text explaining the image. Keeping surrounding image text strong can lead to increased clicks and more time spent on site. The psychology of online user experience influences the effectiveness of great web design. Whether it is through call-to-action size, typography, or images, having a basic understanding of how users interpret design elements will make design better. Don’t start tweets with @username. Starting a tweet with @username restricts its visibility to only you, the person you’re tweeting and any mutual followers. Your reach is automatically cut short! Starting a tweet with @username limits your reach. Here’s an example of a tweet crafted to put text before the first @username to give this tweet a wider reach. Don’t use more than three hashtags in any one tweet. Too many hashtags in a tweet makes it look spammy and reduces your tweet’s shareability. Don’t over-tweet about yourself or your products. The 80/20 rule applies on all social platforms. The 80/20 rule means you spend 80% of the time interacting with and promoting others and 20% of the time promoting yourself and your products. Provide as much value as you can. Listen to your followers and the people you follow. What are their pain points? How can you solve those? When you share relevant, interesting tweets (without over-promoting), people see you as an expert and may recommend you to others as an important resource. Use your other social profiles to tell people about your Twitter handle. Add your Twitter username to the About or Contact sections of Facebook, Google+, LinkedIn and any other social profiles you use. On your website or blog, be sure you have social sharing buttons to make it easy for readers to tell others about your content. 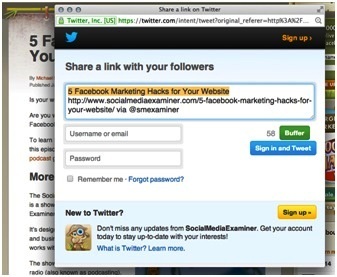 Configure your social sharing button to auto-populate your Twitter username when someone shares an article. Plugins make it simple to install and customize sharing options and expand your reach by adding via @yourusername every time someone tweets content from your site. This simple customization gets your Twitter handle in front of hundreds of users you may not have reached otherwise. Giveaways always drive more traffic, visibility and engagement. Take advantage of that by creating a Q&A giveaway that requires entrants to give their answers by tagging you on Twitter and using a specific hashtag. 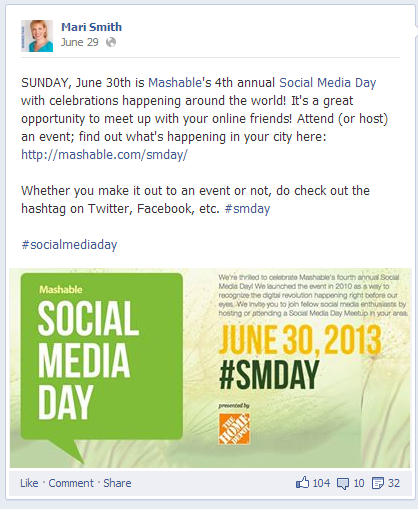 Extend visibility of your Twitter profile by cross-promoting campaigns using hashtags. The hashtag is easy to track and ensures you don’t miss part of the conversation. Requiring users to tag your @username ensures a wider audience sees your handle. Be sure to engage with any users who respond or use the hashtag—it’s just good etiquette and you’ll reach even more people. When you’re ready to promote your giveaway, post the question to all of your social accounts. Start with the platform that has the most engagement, then share across your other social profiles. Don’t forget to share on Twitter! Whether you’re offline or online, networking is a tried-and-true method for extending your reach. If you haven’t started networking on Twitter, now’s the time. If you’re truly listening on Twitter, you’ll be able to tell who the influencers are in your niche—those are the people with whom you want to establish a relationship. Remember, the influencers don’t have to be national in scope, they can be important locals as well (e.g., the newspaper editor or local newscasters). Start a Twitter conversation with a few of the influencers in your niche andadd as much value to the conversation as you can. The more interesting you are, the more likely it is that an influencer will respond to or spread your message. The Fort Collins, CO band @FierceBad has a modest 683 followers, but has established a relationship with the amazingly popular @newbelgium (New Belgium Brewing, also in Fort Collins). 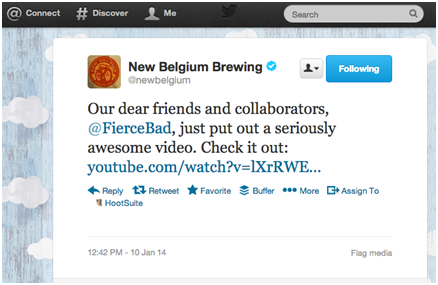 When Fierce Bad released a new video, New Belgium Brewing tweeted it out to their 187,500 fans—quite a bit bigger audience. Influencers can attract huge attention for you on Twitter. If you think you’re alone in trying to build Twitter exposure, think again! There are lots of communities for people just like you who want to network. These communities are generally built around niches, so it’s easy to find one where members share your interests. Shared interests mean it’s easier to find good content to send out to your followers (remember the 80/20 rule!). Since sharing is usually (but not always) reciprocal, you’re benefitting too. BizSugar posts have a Tweet button and the tweets from this community can add up. You’ll find that many serious marketers have a strong presence in multiple online communities like these because they realize the overall value. Joining the same communities allows you to connect with those influencers (and expand your Twitter reach) on a larger scale. The hospitality industry has witnessed a huge surge in mobile activity over the past 12 months, growing at a faster rate than most other industries. A mobile website is no longer a luxury, it’s a necessity. Mobile Bookings are poised to grow exponentially over the next few years and with this comes a need to have mobile specific rateplans. You must ensure you have a range of high quality images loaded to your mobile web app/ responsive design. With exponential growth in mobile traffic and bookings, consider having a mobile marketing strategy to be found via paid and organic search results. Mobile bookings lead time is getting shorter; to grow your mobile revenue, try holding some last room availability where possible. Mobile Monthly Active Users on Facebook increased by over 45% YOY to 874m. If you want to reach your audience emotionally you need to understand what they value and where they come from. Different age groups have different emotional needs and interests, so it’s important to know who you are writing for when you create content . That’s why you have to target content to your audience’s unique generation. What resonates with a Baby Boomer might not be as appealing for a Millennial. People born between 1946 and 1964 are referred to as Baby Boomers due to a mass increase in births after World War II. Baby boomers were raised by parents who had seen the horrors of the war and wanted better for their children. They were raised to believe in their own prosperity, while witnessing their world change dramatically during the turbulent 1960s. Baby Boomers are now over 60. Since so much has changed since the world they came to maturity in, they value stability. Some are nostalgic for the world of their childhood and feel that some today don’t hold the same values they were raised with. To appeal to this generation: Content should reflect traditional values, the importance of family and the continuation of the American dream in a world of uncertainty. When your content reflects these values, Baby Boomers feel secure and optimistic. Generation X — the boomerang generation — is comprised of people who are now in their 30s and 40s. These people were born in the 1960s and 1970s. They were raised with the idea that they could be whoever they wanted to be. Many Generation X-ers wound up moving back in with their families after their career path didn’t work out or were downsized during hard economic times. Generation X-ers often have a negative view of the world due both to the impact of political events when they were coming of age, and, many of them were products of divorce and difficult economic times. To appeal to this generation: Many people of this generation are parents who want their kids to be successful and proud of themselves. Content that stresses the importance of individuals, encourages people to be themselves and inspires pride in standing apart from the crowd will appeal to them. Generation Y, or the millennial generation, is comprised of people who were born between 1980 and 2000. They’ve recently entered, or will soon enter, the workforce. They tend to be well-educated, are idealistic and technologically savvy. Although some research suggests this generation feels “entitled,” in actuality, Generation Y-ers tend to have a different outlook due to their web-savviness and their need to feel they have to make a difference. Generation Y is full of people who expect a lot from the world. They may be disappointed with the country’s status quo and are more likely to be active in politics or social movements. To appeal to this generation: This generation values openness, fairness and justice; content that appeals to these values is likely to grab their attention. It’s hard to market to the youngest generation because its members are no older than 13. Since Generation X or Y is likely to be the parents to this generation, marketing to those generations will be effective. However, Generation Z is likely to be highly technologically savvy at a young age, interested in items that make members feel grown up, and, like their parents, they’ll eventually be highly educated. This generation may be concerned with economic or social problems as it gets older. In addition, Generation Z is a skeptical generation. Members feels that adults have left a mess in the world they will soon inherit and are hyper-sensitive to any attempt to trick or pressure them into buying anything. To appeal to this generation: Content that makes members feel more mature and grown-up without having any obvious agenda is likely to be successful.